While you may not remember the names, Dr. Charlie Miller and Chris Valasek, you may recall what they did in 2015. They were the two researchers who exposed the cyber-security holes in the FCA/Chrysler connectivity system that left their vehicles vulnerable to cyber-attacks. Miller and Valasek famously conducted a test whereby they hacked into a Jeep’s system and took command of many of the vehicle’s controls – remotely – while it was traveling down a freeway. (The full story is definitely worth reading – click here) In further tests, by hacking remotely they could disable or slam on a victim’s brakes, turn the steering wheel or, in some cases, cause unintended acceleration. As Dr. Miller points out, with the ever-growing race to autonomy, the risk for cyber-attacks on vehicles is a paramount issue. Connectivity in vehicles will be essential to their automation, leading to computer systems having far greater control over the vehicle’s function than they already do today. Automated vehicles in the future likely will not have a steering wheel or pedals, which in some cases could be used to take back control, leaving occupants entirely at the mercy of the hacker. While we are not ready to reach that level of automation with our vehicles yet, preparations must be made. Dr. Miller has been addressing these issues head-on. He claims that fundamental changes must be made to truly secure these systems and has proposed several fixes. To limit vulnerabilities, Miller has suggested a ”codesigning” system that prevents messages that did not originate from the system from being run. This is done by utilizing cryptographic keys to determine the trustworthiness of the message. The codesigning system which Miller and Valaseck have prototyped would prevent the car from following commands that it recognizes as being foreign, and would block the message from being acted out by the vehicle, as well as alerting the passengers of the anomaly. 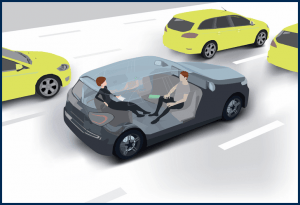 If you are interested in more information about the future of autonomous vehicles, email Shawn Harrington at CrashAxe@arcca.com.